Paul Evans describes the creative ‘work in progress’ on our forthcoming HEART of Cardiff Heritage Trail. Co-design and co-production have been central to both the ethos and the process behind The HEART of Cardiff Heritage Trail. Working with Dr Kate Moles and Dr Stephanie Ward from Cardiff University departments of Sociology and History, I devised a series of geographical and temporal mapping workshops that would tease out memories of Ely and Caerau and serve to: a) translate the impersonal 1:10,000 scale map produced by the HMSO into a personal, meaningful, local geography based on the thoughts, memories and emotional responses of local residents, and b) create a physical timeline reaching back into living memory. The first of these workshops took place at the headquarters of the Grand Avenue Times (GAT) women’s group at Windsor Clive Primary School, Ely. 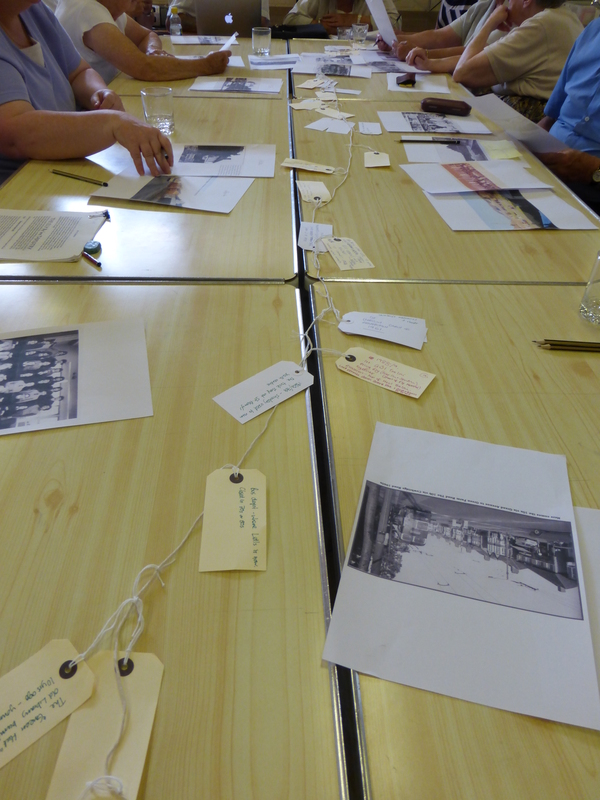 Here we created a ‘layered map’ of memories and reflections based on the group’s knowledge of the local area. 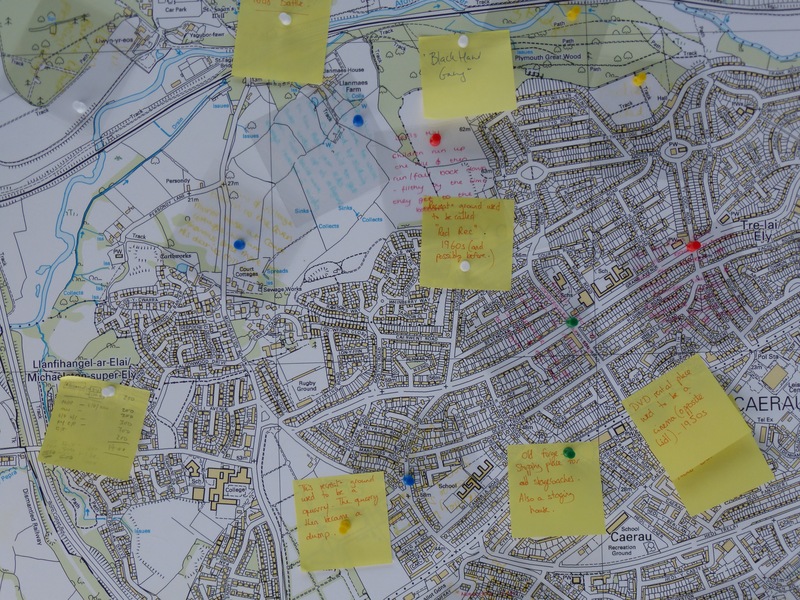 Fragments of a lively and dynamic conversation about Ely and Caerau were written onto transparent acetate squares and pinned in place onto a large (A0) 1:10,000 scale map of the area. The conversations were also recorded. Edited fragments of these conversations will be made available online soon. 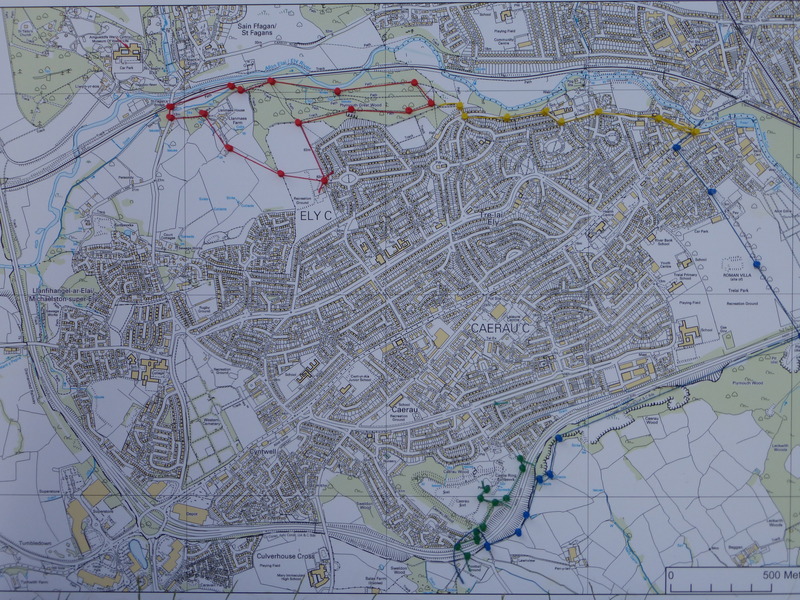 This layered map has allowed us to plan the first stage of the Heritage Trail route – a loop through Plymouth Woods starting from the recreation ground at the end of Archer Road. 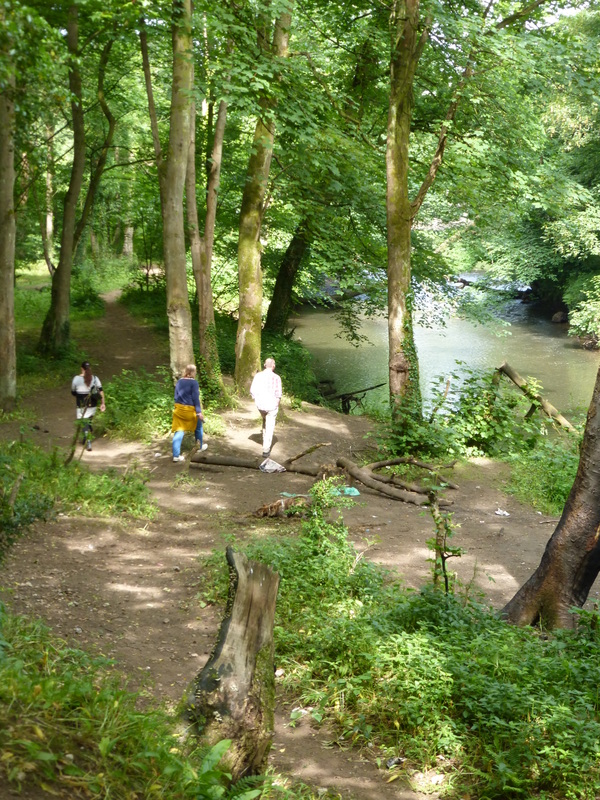 We followed this route on a beautiful sunny day, about a week later with Ceri-Ann Gilbert from GAT as our guide. The next group that we worked with was Healthy Wealthy and Wise: senior citizens based at the Old Library, Bishopston Road, Caerau. Here we created a timeline of memories written onto luggage labels that were ordered chronologically and then tied onto a 4m length of string. 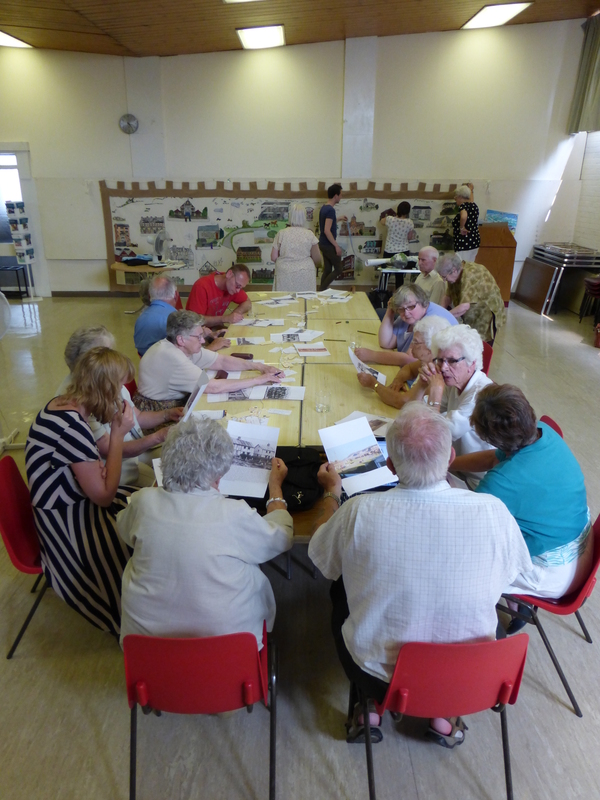 Some fascinating and poignant memories emerged from this workshop and these have also informed our planning for the heritage trail route. This research has also fed into a new design for the tapestry that is currently on display in the Old Library. Work is currently in progress on this new design with pupils from Glyn Derw High School – more information on this ongoing project will follow soon. Outputs from both of these workshops were displayed at the CAER Heritage Project/HEART of Cardiff Roadshow at the Ely Festival on 13 July. Central to our presentation was another large map with the speculative route for the HEART of Cardiff Heritage Trail marked out in pins and coloured thread. Our first suggestion for the route was soon altered on the basis of local knowledge and we were also advised that it might be best to break up the heritage trail into manageable sections. 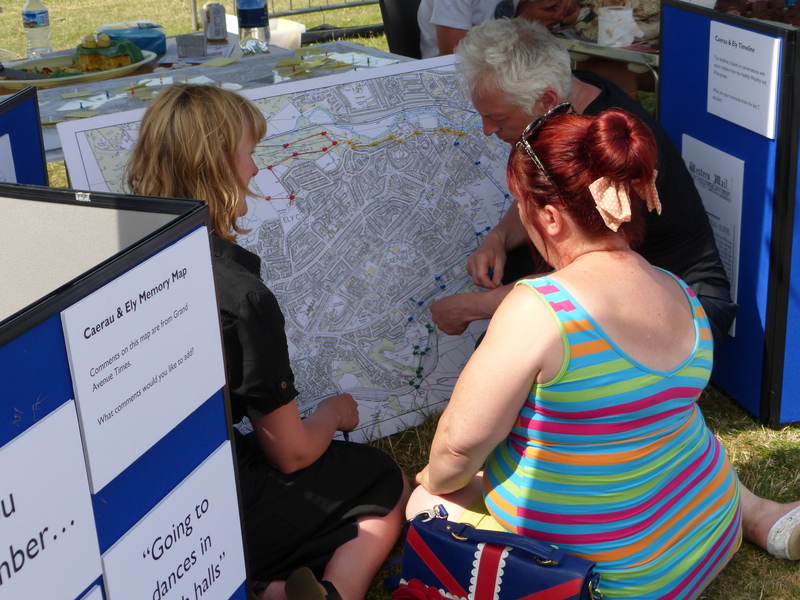 Work on the trail will continue over the autumn and during this time we very much welcome further input ideas, memories and reflections from local residents. Why not get in touch with your ideas?